There are 25 silver Coins and 15 gold Coins. Silver Coins have a value of 1, and gold Coins have a value of 5. You will earn 1 victory point at the end of the game for each 10 Coins worth of value you have. 6 Number of Tile Resources required. 1 Shuffle the Building cards and place the deck with the Construction side up at one end of the table. Place the top five cards in a line next to the deck. 2 Separate the Apprentice Workers from the rest of the Worker cards. Deal one Apprentice randomly to each player. Return any leftover Apprentices to the Worker deck and shuffle it. 3 Place the Worker deck next to the Building deck. Turn over the top five cards and place them in a line, below the line of Buildings. 4 Place the Coins in the middle of the table to form a "bank". 5 Give each player 10 Coins (1 gold Coin and 5 silver Coins). 6 Randomly choose a First Player. That player takes the First Player card and places it in front of him. The game is played over a series of turns, starting with the First Player and passing to the left. On your turn, you get to take three actions. If you wish, you may pay for one or more additional actions. Each additional action costs 5 Coins. Starting Construction Costs One Action. 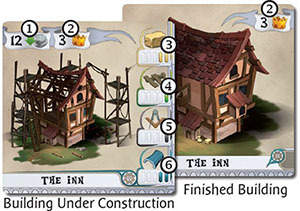 Choose one Building from the five Building cards in the line and place it in front of you. Then, immediately fill that space in the line with the top card from the Building deck. You may construct any number of Buildings at the same time. You may repeat this action during your turn as many times as you wish (as long as you have actions). Example: This player has decided to build the Chapel. He takes the Chapel card and places it-Construction side up-in front of him. Recruiting A Worker Costs One Action. Choose one Worker from the five Worker cards in the line and place it in front of you. Then, immediately fill that space in the line with the top card from the Worker deck. You may recruit as many Workers as you wish. Example: It's going to take more Workers to finish that Chapel. So, the player recruits: he takes the Craftsman and places it in front of him, with his other Workers. Sending A Worker To Work Has A Variable Action Cost. Place one of your Workers next to one of your Buildings under construction, so the Resources produced by the Worker line up with the requirements of the Building. 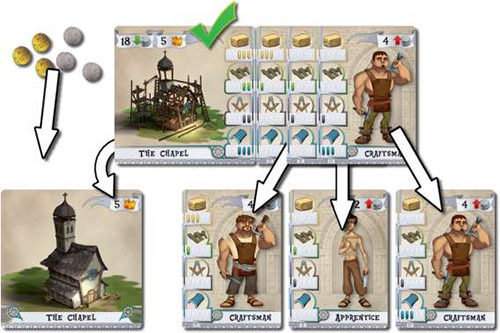 When you place a Worker, you must pay the number of Coins in the upper right corner of the Worker card (to the bank). Once you send a Worker to work on a Building, that Worker cannot move until the Building is complete. Each time you add a new Worker to a Building, place it so its Resources line up with the other Workers there. But, if you send another worker to a different Building, it only costs you one action for that worker. Taking Coins Has A Variable Action Cost. For three actions, you may take six Coins. Remember: You will earn 1 victory point for every 10 Coins worth of value at the end of the game. Finishing A Building Is Not An Action. When you Send a Worker to work on a Building, if the total Resources of all the Workers you have added to that Building now equals or exceeds the Building's requirements, the Building is complete. Workers return: The Workers you had assigned to that Building return to your team (place them in front of you with your other Workers). Receive your pay: You earn the number of Coins shown on the Building card from the bank. Then, flip the Building card over and set it to the side, with any other Buildings you have completed (this makes it easy to total up your victory points). 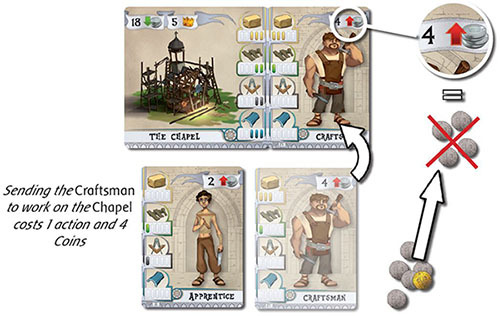 By sending his Craftsman to the Chapel (for 4 Coins), the player has completed the Building! Note that the Chapel requires 3 Stone, 2 Wood, 2 Knowledge, and 3 Tile. Adding the Craftsman brings the 1 Knowledge and 3 Tiles that were missing, so the Chapel is complete. Machines are a special type of Building you can build. When you finish building a Machine, it is treated like a Worker that does not require any payment for its work (the cost in Coins to send a Machine to work is zero). A Machine is built exactly like a normal Building, and is worth victory points when it is completed. But, instead of setting the Machine to the side (with your other completed Buildings), it remains in play after you flip it over and joins your team of Workers. If you have 17 or more victory points at the end of your turn (counting only Buildings and Machines, not Coins), the game will end. Any players who have not yet had a turn in the last round each take a final turn (so all players will have an equal number of turns-the last player to take a turn will be the player to the right of the First Player). So, if the First Player earns a total 17 victory points on his turn, all of the other players still get to play their last turn. On the other hand, if it's the last player who triggers the end of the game, the game ends immediately at the end of his turn! Once all players have finished their last turns, each player totals up the victory points for their completed Buildings and Machines. Add 1 victory point for each 10 Coins worth of value still in your possession. 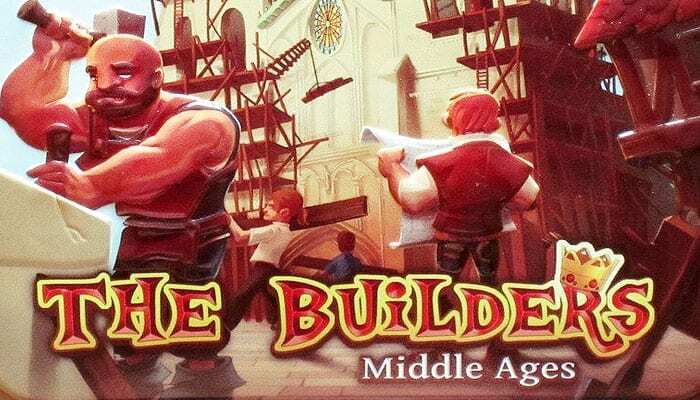 The player with the most victory points is hailed as the Kingdom's Master Builder, and wins the game!